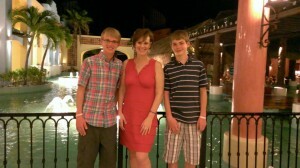 Taken in Cancun during our favorite word: Remission. You could add “Watch” to the list, because for some cancers, there’s no treatment except for Watchful Waiting, in which your doctor periodically checks whether or not your tumor or tumors have grown. If they have, then you’ll probably have a slash, burn, and/or poison to blast those suckers. Some people call this a chemo “cocktail,” but there was nothing relaxing or “Let’s rehash our days” about it. It was a brutal Poisoning that took my muscle tone, hair, and energy, and kept me from my kids for the better part of a month while I endured two rounds of inpatient chemo sessions, followed by four more outpatients chemo drips in the months that followed. It also saved my life. It was the therapy to cure my cancer and not my disease that scared the bejezus out of my children, who were 8 and 10 at the time of my diagnosis of non-Hodgkin’s lymphoma. Though I’d been sick with fatigue and coughing as the tumor in my left lung expanded to the size of a softball, I was far sicker during chemo. Also, bloated (thanks Prednisone!) and bald, which is particularly disconcerting to children. Before chemo, I didn’t look sick. After my hair fell out, however, my bald head and drawn-on eyebrows were constant reminders to my kids that Mom wasn’t herself, and that life would be very different for them for a long while. Tumor. I called it a “blob in my chest,” which is an age appropriate euphemism. Scared, as in “Mom’s scared.” I was, but I billed the process as something I had to go through to get healthy, like a project with a lot of naps. I did this, because my particular cancer was curable. Tired. I wasn’t about to pretend that the chemo wasn’t sucking the energy from my marrow. 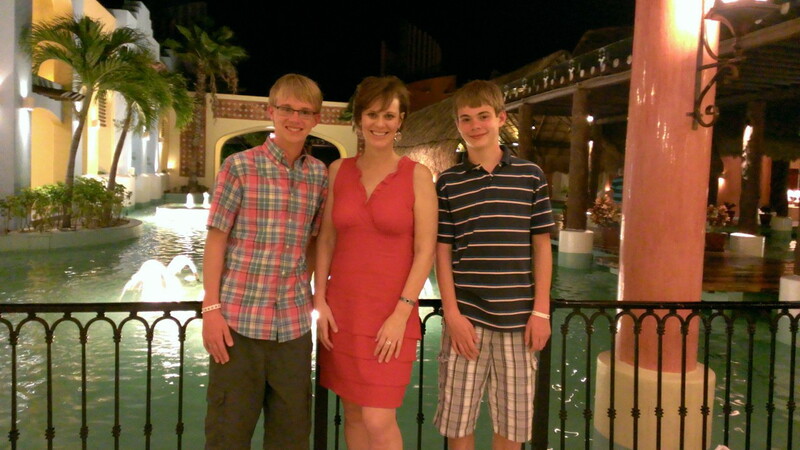 They needed to know that Mom needed her rest, and that there would be good days and bad days. Play. I wanted them to know that it was okay for them to play and be kids even though I was sick. When I saw a baseball being thrown up and down outside my window while my son wore a blue Marge Simpson wig a friend has sent for me to wear, I knew I’d gotten my message across. Temporary. While my months of Burn and Poison felt like forever, I wanted the kids to know that it was temporary. They would make me sicker first and then healthier, and eventually, treatments would end. My younger soon made it a habit of rubbing my bald head every night after chemo ended, in an effort to make my hair grow back. When the first stubble arrived, we rejoiced–and he felt like he’d helped make it happen. Share, share, that’s fair: When it comes to parenting with cancer, what words do you avoid and which do you make sure to use?